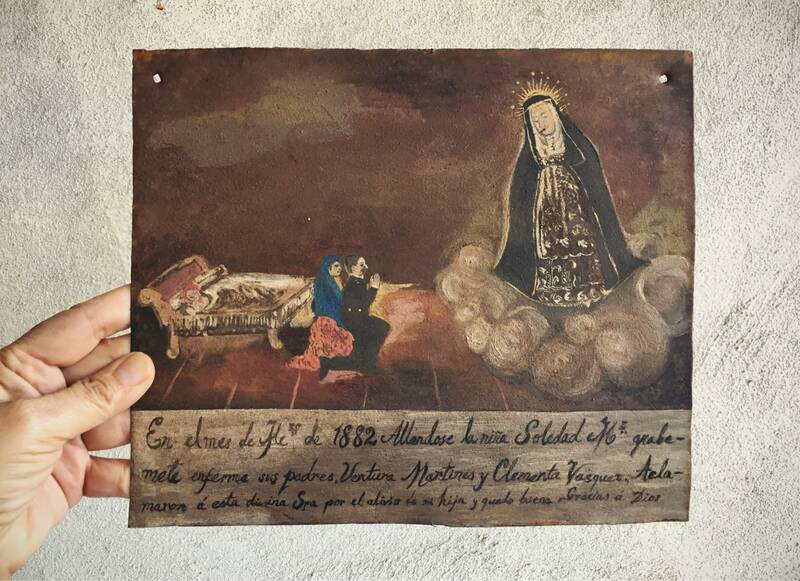 I have been collecting Mexican ex-votos--or "láminas" as those made of metal or tin are called in Spanish--since the early 1980s, and while I have only a small collection, each one is absolutely wonderful. 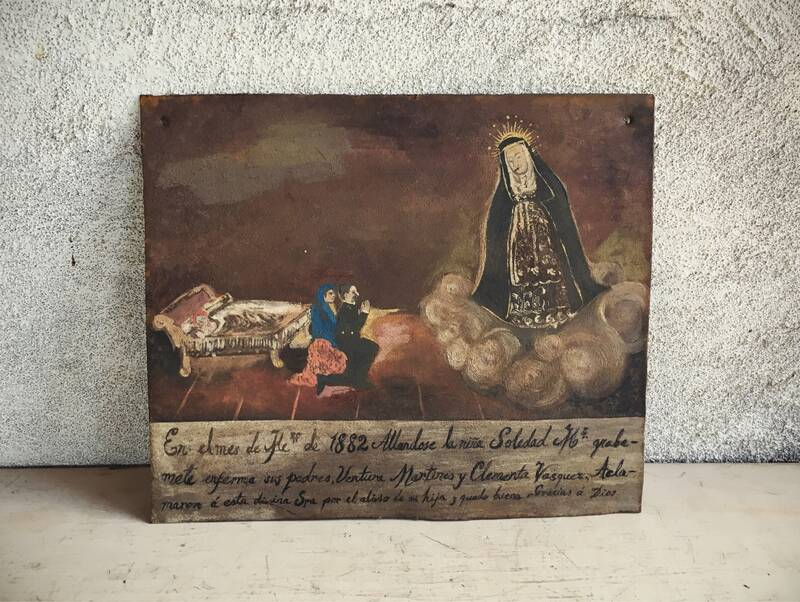 Mexicans are people of great faith, and when someone fell sick or got into trouble and then recovered, the idea was to express your request or thanks by painting it on a piece of metal or wood to the patron saint who could answer your need or to give thanks to the saint for answering the prayer. 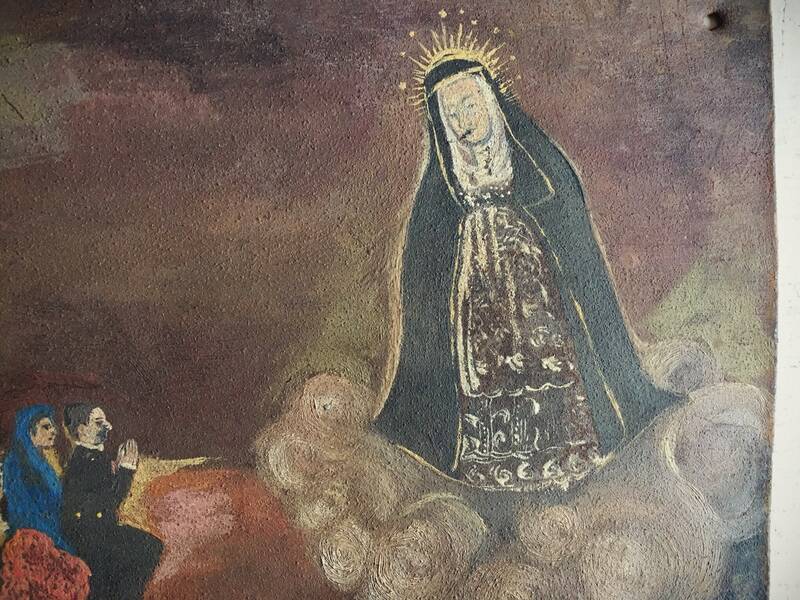 In early days, someone might take their prayer to a local artist who was know to have a great hand with a paintbrush, and that person would paint the request. 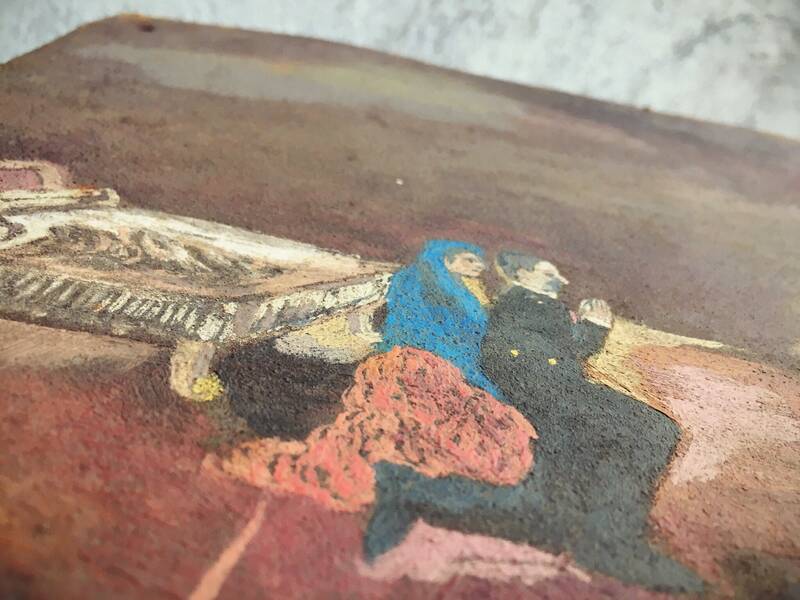 Later, though, this became something you might do yourself, a form of folk art, and the pictures as we look at them today are absolutely charming. 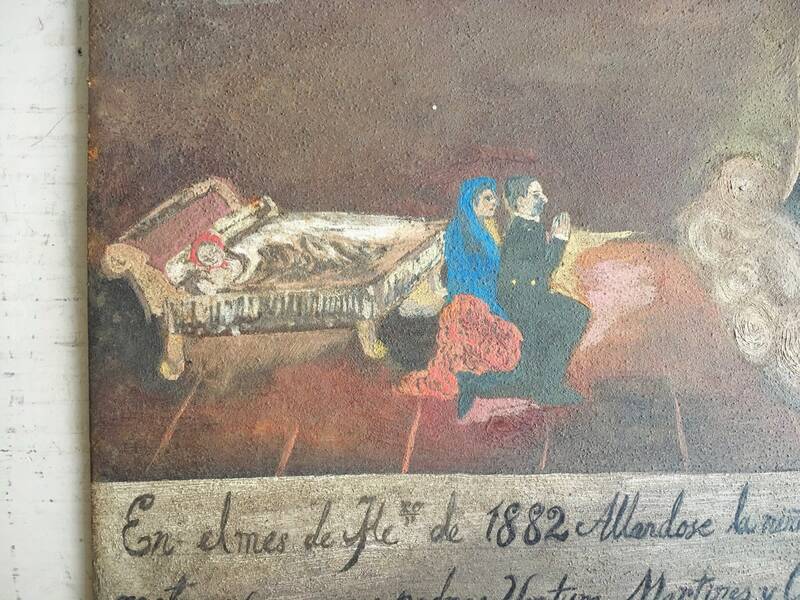 This lamina was painted in 1882, and is a thank you from the parents of a girl named Soledad who fell sick on a month, I believe March or May. 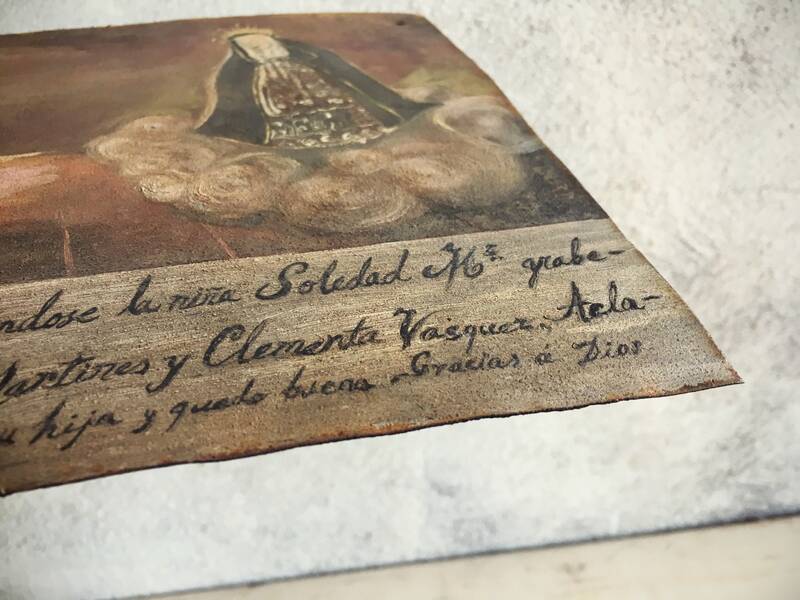 The story handwritten at the bottom tells us that her parents Ventura Martines and Clementa Vasquez asked the Divine Mother Saint for a cure for their daughter, and that she did recover. The handwriting is in the style of that of Mexican and Spaniards in that era, with flourishes on the ends of As and Ms, as an example, and numbers ending in curlicues. 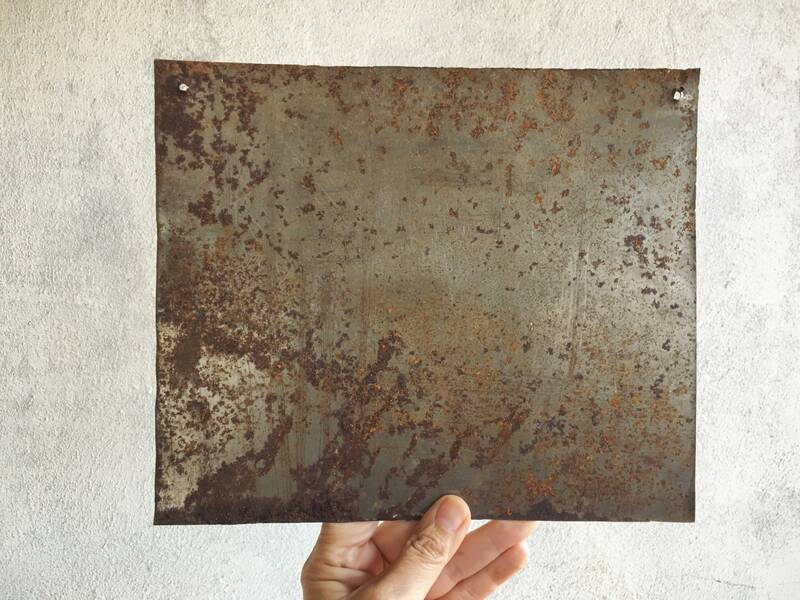 The image, by now grainy from the natural rust and aging of the metal piece onto which it is painted, depicts the Divine Mother Saint on a cloud, her face benevolent and golden (faded) rays about her head. The parents are small in comparison and kneeling in prayer and to thank her. Their daughter lies in a bed behind them. 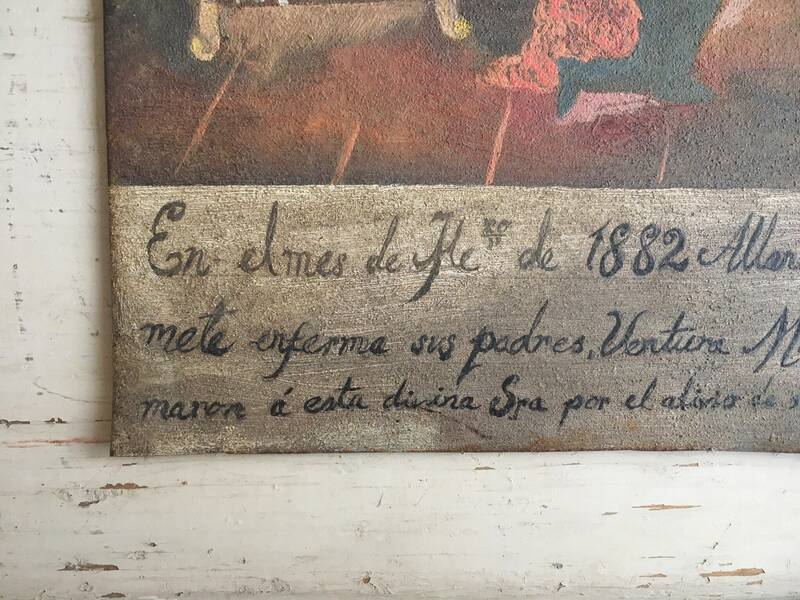 I found this piece in a Mexican antique store. 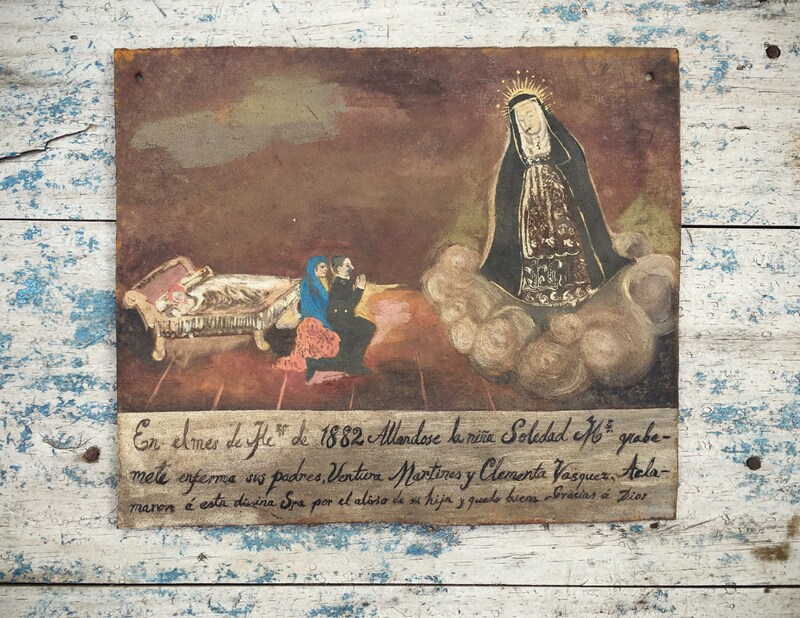 You see many ex votos today that are reproductions of this folk art form, and they are wonderful in their charming stories and vibrant colors. But to find one that is truly old is quite rare. This one measures 10" wide by 8-1/2" tall. The metal has a two holes at the top into which wire would have been thread for hanging. The power of faith, and the power of the past. May they both endure. Roma, what can I say? You've done it again. This mystical, magical, miracle painting arrived today. She couldn't be delivered yesterday b/c of the unexpected snow storm we had; but, I think it was really b/c she wanted to make her grand entrance on Her feast day today!!! She is, of course, inspiring me already with her sacred message to trust Her with the miracles we so desperately need! I loved reading your story of miracles too and the family of wildness that defines you. I too am a westerner, and thrive in the joy that defines that place in our heart that is wide open, free, creative, beautiful and part of the land that we grow out of and share! Blessings to all of you and thanks for your sacred DOTD art! I embrace your gift with love and respect! Go BOHO!